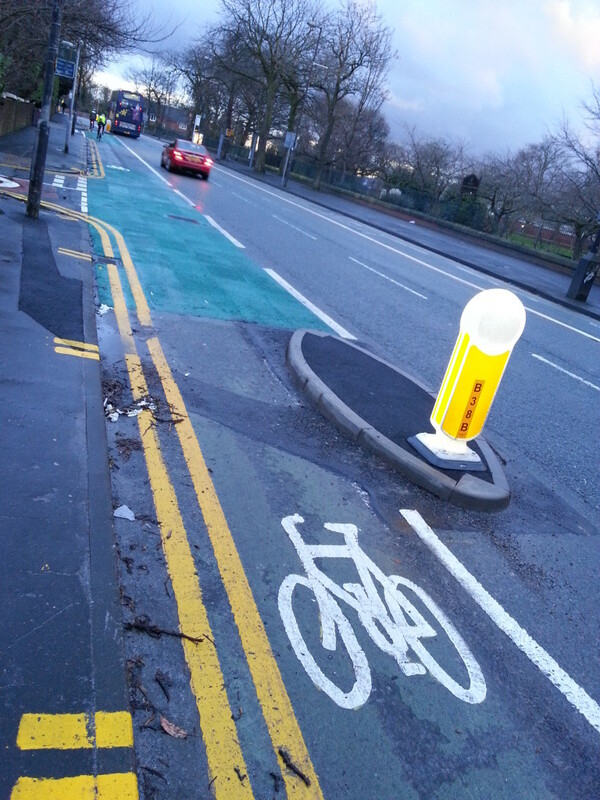 The introduction of a new Segregated Cycle Lane on Wilmslow Road in Manchester is welcomed by Enjoy Cycling. Over the last week or so the new cycle lane has been taking shape on what some people may argue is one of the safest parts of the road already. The segregated cycle lane runs along the South bound side of Wilmslow Road in between the dangerous areas of Rusholme and Fallowfield. A number of islands have been installed and a wide cycle lane has been created with the use of green tarmac in places. The same section of road has a bus lane on the northbound side that includes a cycle lane. I for one welcome this move forward on what is a busy commuter route in to the city centre and to the universities. A segregated cycle lane on Wilmslow Road offers that extra protection on a very busy road. However I am concerned that there are other parts of Wilmslow Road that need investment in order to make cycling safer along the route. The new cycle lane is on one of the widest parts of Wilmslow Road so it has been easy to install and has caused little disruption. The areas of Rusholme, Fallowfield and Withington are in need of investment when in comes to making cycling safer. Another concern for me is that other road users do not respect the new cycle lanes and like others in the city become cluttered with parked vehicles. As a regular user of the Wilmslow Road cycle lanes I get sick and tired of cars and vans parking in the cycle lanes time and time again in the same places. Blocking the cycle lanes causes cyclist to stop and often we have to enter the main flow of traffic which can be dangerous. More should be done to combat illegal parking in these places. What are your thoughts on the new cycle lane?